Maria looked like she was on the verge of collapse during this morning's exercise session. The Namibian stunner was a shadow of her normal cheery self as she reluctantly lifted a leg here and did a bit of a stretch there. Her mouth is the only part of her anatomy that seemed to be getting any exercise, courtesy of all that yawning she was doing as the instructor took the Housemates in the Ruby House through their paces. Could her late night chat session with Elikem be the culprit? Last night, the two clearly had a lot to talk about as the rest of the House slept. Maria filled Elikem in on how Angelo has been making moves on her. Elikem listened intently as the stunner told him how she has a boyfriend at home and does not want to complicate her relationship with Angelo. After morning exercise, Maria decided her time would be best spent with the South African. She slid to the floor next to him, behind the kitchen counter and had a hearty breakfast as Angelo looked on. Maria has been honest about her situation back home but these two can't seem to leave each other alone. Hahaha but Angelo told d Diamonds he has a swt rship bak home! So who is fooling who? Maria needs a young blood!Eishhhhhhhh! Maria has feelings 4 Melvin not Angelo.she is jos playing alone!Angelo Annabel is crying 4ur love! 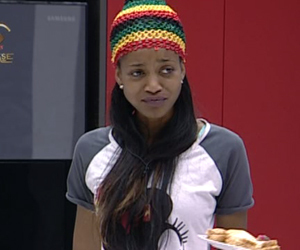 Hahaha I laugh, BBA house, controversial house.